It is an African adage that says a child who will not let her mother sleep will do so when she herself sleeps. Otherwise, both mother and child will continue to keep awake. Put in another way, the man who pins another down in a wrestling match also pins down himself. Whenever he gets up, his rival equally gets up. In effect, this is the uncompromisable condition in which Nigerians have found themselves over the last two decades or so. Apparently the young nationalist had a point here – a point that practically every Nigerian knows. And yet, is anyone in doubt why dismantling the social and political structures which have consolidated the country’s vision and sense of unity in the hands of a few visionless rogue leaders, appears to be so difficult? The first reason is that there is no place for trust on the part of those who seem to be clamouring for change in the system. Instead, saboteurs wait in line at every turn of events, to collect a pittance from these very same oppressors so that they can enable them perpetuate their greedy ‘governance’ over the majority of the largely uninformed people. So, the question becomes: who are the real enemies of true democracy – the greedy politicians who are bent on greasing the palms of willing unpatriotic Nigerians to enable them remain “relevant” in the scheme of things in the country or those unpatriotic Nigerians who are willing to be bribed in order to swing their votes in favour of their benefactors and thereby deprive Nigerians of the legitimate leaders they deserve? While there are reasons to line up and fight our “common enemy” whoever he is or whatever it is, is it not necessary for the ordinary Nigerians to guard against surprises if they are in for this battle? Only those who have the experience know what is involved in a war. And so, having that understanding at the back of my mind, I watched this Channels TV interview of Senator Enyinnaya Abaribe over and over, I don’t remember how many times. Honestly, I don’t even know why I am attracted to the conversation. But I am attracted to it and I find it so interesting that I think I am committed to the ideas Abaribe was trying to transmit across to Nigerians. Obviously, there are issues in the equation that need to be tracked and trashed in the dicey union called Nigeria. 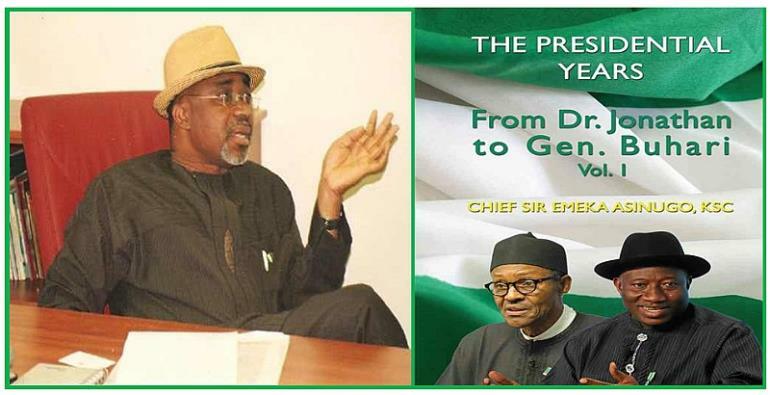 I have already made most of these issues public in my recent book published in London by Austin Macauley publishers and titled: ‘The Presidential Years: From Dr. Jonathan to Gen. Buhari’. Anyone can buy the book online through major book dealers like Amazon Nigeria if the one lives in Nigeria or through any of the other numerous online outlets. In the past two decades or so, there have been persistent agitations within both the southeast and northeast states of Nigeria for a re-structuring or break-up of the rickety union called Nigeria. This is basically because most of the Igbo of the eastern states and the Delta region of the Deep South consider the sort of second class citizenship treatment meted out to them by the federal government of Nigeria as unfair and underserved. Just two examples will suffice to bring their argument home. First is that in this political dispensation, almost all the heads of key security offices in the country were assigned to Muslims from the north. It is a situation many Nigerians recognize as grossly undermining the constitutional provisions for a federal character. Before the Presidential elections of 23 March 2019, the President and Commander-in-Chief of the Armed forces who also doubled as Petroleum Minister was from the north. The Senate President was from the north. The Speaker of the House of Representatives was from the north. The National Security Adviser was from the north. The Chief of Army Staff was from the north. The Chief of Air Staff was from the north. The Chief of Defence Intelligence was from the north. The Defence Minister was from the north. Secretary to the Federal Government was from the north. Chairman of the Independent Electoral Commission was from the north. The acting Chief Justice of the Federation was from the north. President of the Court of Appeal was from the north. The Chairman of the Economic and Financial Crimes Commission was from the north. President of the Federal High Court was from the north. The Comptroller of Customs & Excise was from the north. The Comptroller of Prisons was from the north. The Comptroller of Immigration was from the north. The Comptroller of Fire Service was from the north. The Managing Director of Nigeria Ports Authority was from the north. The Managing Director of Nigeria Deposit Insurance Corporation was also from the North. These were the people in whose hands the destiny of the country lay in the Buhari administration. Only very few positions were offered the entire south of the country, for which President Buhari expected them to be grateful. Some of these were the ministerial appointments which had followed the constitutional stipulations. And so far, there is no indication that the pattern is likely to change and embrace a broader spectrum of qualified Nigerians. Consequently, Nigerians from the east and the Deep South argue that it is the administration that is making unity difficult for Nigerians in their totality and they wonder for how long the APC government would be able to sustain these lopsided federal appointments. Take another example. The National Common Entrance Examination [NCEE], Board recently published the cut-off marks for each Nigerian state in the 2017/2018 common entrance examinations. As would have been normal in a democracy – except if every zone had a level of autonomy in the control of its educational programme – the same cut-off mark should have been made compulsory for every Nigerian child, irrespective of the child’s state of origin. But characteristically, every state was given a different cut-off mark by the federal government presumably according to the academic ability of students coming from those states. The cut-off marks were as follows (alphabetically): Abia, 65; Adamawa 40; Akwa Ibom 63; Anambra 66; Bauchi 18; Bayelsa 51; Benue 60; Borno 33; Cross River 54; Delta 65; Ebonyi 60; Edo 63; Ekiti 62; Enugu 65; Federal Capital Territory- Abuja 57; Gombe 37; Imo 66; Jigawa 37; Kaduna 52; Kano 34; Katsina 37; Kebbi 35; Kogi 61; Kwara 62; Lagos 65; Nasarawa 42; Niger 49; Ogun 65; Ondo 64; Osun 64; Oyo 63; Plateau 52; Rivers 62; Sokoto 15 for males and 7 for females; Taraba 19; Yobe 20; Zamfara 14 for males and 12 for females. The irony of this fact is that it is still the citizens from those states which have very low cut-off marks who will be saddled with the management of the Nigeria of tomorrow. They are the ones who will be appointed into high public offices as high court judges, comptrollers, ministers and heads of government agencies and parastatals. Those whose cut-off marks were high would be told they don’t “qualify”! For that and many more reasons, most Nigerians believe that there is need for them to redress the current understanding of “unity” in the country. Most Nigerians are advocating for a new constitution that will be drafted by elected representatives of the people for the people and not one that is imposed on them by the military junta that kept Nigeria in the messy condition it has remained since its invasion of democracy in 1966. This issue of a new constitution is one grey area advocates for change in the National Assembly should concentrate their war. Nigerian legislators have a duty to educate their local constituents and get their mandate to lobby their parliamentary colleagues to acknowledge that Nigerians want a new constitution. They should collect signatures from their constituents that will inform the entire legislature that this idea of a new constitution is what a majority of people from each of the constituencies want. That is one way to start and get about the war against injustice in the country. So many agitations across the country and even the inability of INEC to conduct violent-free elections in 2019 all point to the fact that the quality of mediocre politicians on the stage are far from what Nigerians expect. That is why the east and some other parts of the country are clamouring for their independence. This crop of politicians must prove them wrong by righting the anomalies that are prevalent in the system which tend to make a mockery of the country’s democracy. Of course, the Igbo know that a break-up of Nigeria would affect their businesses and investments negatively and are precautious. They know that many northerners who have lucrative businesses, supplying onions, yams, goats, carrots and similar food items in the east have come to take their residences in the eastern states, where they have lived in for so long, as their home and that they, the Igbo have no problem with that, as long as the businesses are legitimate. The Igbo are known to be industrious and enterprising and so, the only thing clamping them down in Nigeria succeeded in doing was to push them abroad to so many European countries from where they could even see and articulate better the massive fraud that is called Nigeria. In that way, Nigeria continued to suffer brain drain as most of those whose contributions would have helped in no small measure to make the country economically and socially viable literarily escaped to work for foreign countries because they couldn’t stand the heat called Nigeria where getting into public offices had expressly become a do-or-die affair. In the North, the Boko Haram has continued to agitate for a separate Sharia country since 2010. In the attempt, the sect has been fragmented into two factions: one politically motivated and the other a brigand cult that is more into sacking natives from their ancestral homes and stealing their cattle, food items and beautiful daughters. Recently too, the spate of kidnappings in some northern states like Zamfara has become a development of great concern to many Nigerians. So also are the unpredictable activities of Fulani herdsmen in the north. In the western states, the daily accelerating cases of Nigerians being kidnapped for huge financial ransoms or killed for money-making rituals is also becoming a major problem for the police. Armed robbery and what has become known as ‘baby boom factory’ in the eastern states are no less the police headache. And I make haste to ask: why are all these things happening now? So, to avoid this mockery of democracy being infested on the country by incompetent public administrators, the legislators need to do some home work. It will not be so easy but it will be the test of their willingness to learn and grow on the job. It will be the reason Nigerians may not need a replacement of the current crop of legislators so soon. Charity they say begins at home. So, the leaderships of the National Assembly or better still the President himself must summon the courage to table a motion that will drastically cut down on the over-all take home pay of the Nigerian legislator. Considering the income of an average Nigerian and the fact that Nigerian legislators are Nigerians and morally they should patronize Nigerian markets, Senators could earn about N2m a month – inclusive of constituency, staff and sundry allowances. The Presidency gets about N2.2m monthly and the Vice President about N2m both inclusive of staff and sundry allowances. Governors earn N2m and down the line. In this way, public offices will no longer be seen by career politicians as a safe haven for milking public funds. In other words, public offices will no longer attract rogue politicians and their criminally minded partners in the business community. Beyond that, the leaderships of the National Assembly must ensure that every single legislator has two constituency offices – one in the capital town or city he is representing and another in his country home. Legislators must assign one day in the week for surgery – when they can meet with members of their constituencies to look into major issues bothering them and their families. These issues are carried along to the National Assembly by the official representatives of the people. They lobby their colleagues to see that the motions they are presenting on behalf of the people they represent sail through. The absence of this education of the voting masses by their legislators is the reason in places like Warri, despite the fact that they are the people whose land produces the oil on which the national economy relies, there are hospitals that have no NEPA supply and no generators or money to buy petrol for them and schools that have so dilapidated they constitute a major eyesore to visitors to the area and a massive hazard to pupils who use them. This would definitely not be the situation if the legislative representatives at parliament usually had weekly meetings with their constituents. So, the leaderships of the National Assembly must monitor individual legislators to ensure that Nigeria’s choice of democracy is not a mockery of the way democracy is practised everywhere else. Once this is done, and a sense of belonging has been firmly established between the legislators and their people, the law makers would have the moral courage to summon leaders of agitating factions to table their grievances before the National Assembly. What does Boko Haram want from Nigeria? And what does IPOB want? What does Arewa want? And what does OPC want? All these are tabled before the National Assembly which will now get back to their individual constituencies, discuss the issues with their constituents in a frank and open manner, get their mandate on the issues agreed on, and table them in the Assembly for discussion and decision. For peace and sanity to return to Nigeria, Nigerian legislators must show some sense of maturity in their business of managing the country. It is not always all about money. It is more about the values we create for our society. It is more about the welfare of the ordinary citizens who walk our streets and village roads. It is more about the future of Nigerian children and their children’s children. It is about the child who goes to bed to allow her mother sleep and the man who is released from the ground when his mate gets up from pinning him down. For, indeed, nothing is more successful than success. Here again, Ehidiamen Afama-Eromsele’s observation readily comes to mind: “The problem of Nigeria has never been our diversity but lack of corporate and formidable national vision. When we have a goal, a vision, nobody cares where anybody comes from! The greatest harm that our leaders have done is to succeed in making us believe we are divided. No, we are not! They are the ones who don't have goals, solid visions attractive enough to bring us together. Trust me. Our diversity is our strength and not our disaster. We must take deliberate steps to knock unfortunate and "visionless" leaders out. Then, we can have a true and grand celebration of our democracy as a people, united and strong.” Having articulated that much, it is now left for the elected law makers to ensure that most importantly they engage seriously with dispensing with feeding-bottle democracy. This author has authored 168 publications on Modern Ghana.